Installing a set of LED Under Car Lights may seem like challenge, but the overall concept is simple. 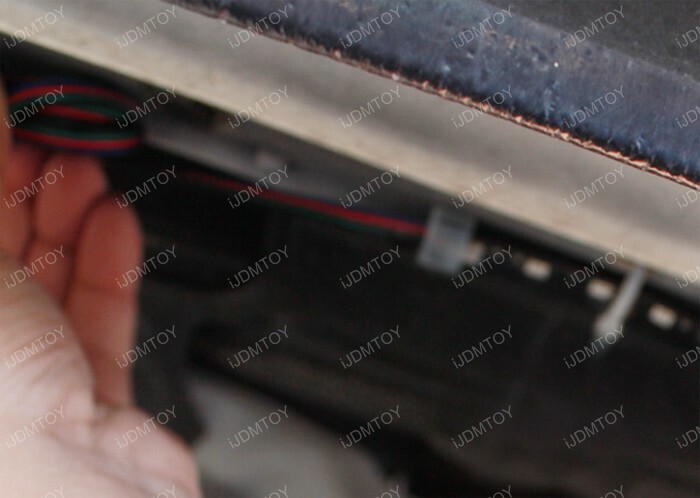 You will be securing each of the LED strips to surround the outer edges of the vehicle underside and extending the wires up to the engine bay to power up the LED strips. Before you proceed with the installation, clean the areas that you will be attaching the LED strips on. This includes the underside of the front/rear bumpers and the side skirts. You can use a washcloth to gently wipe off any dirt or mud residue so the LED strips won't get dirty. If you have a hydraulic jack, this will greatly increase efficiency since you can jack up the car for more access to the underside of the vehicle. If you don't have a jack, you can still proceed with the installation. 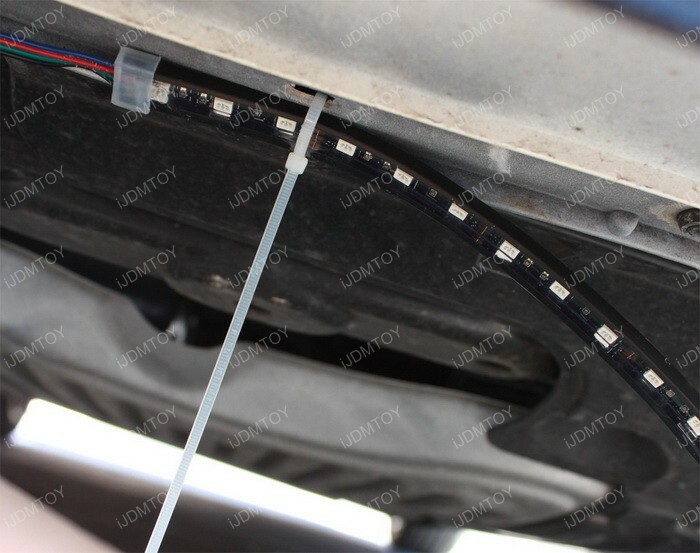 *This set of LED strips has been redesigned so that you can install them the conventional way and individually route each wire to the module box in the engine bay, or you can install them by connecting the strips together with their respective adapters. All four pieces have interconnecting adapters so they can receive power from the battery. You no longer have to use an extension cord to route the power from the rear LED strip to the battery, since all the strips are attached. 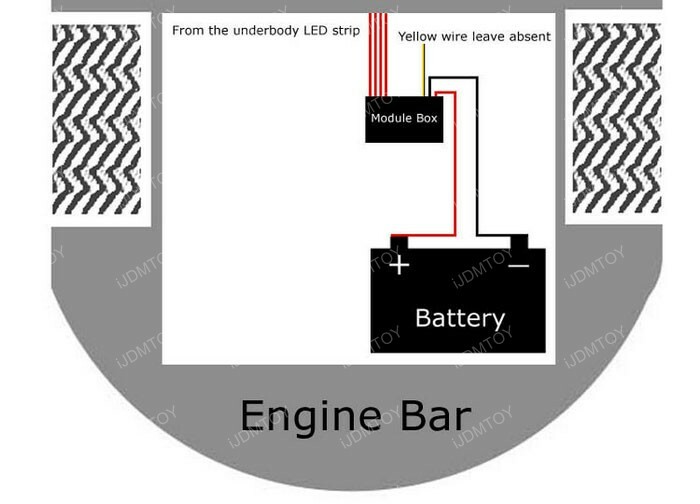 This diagram demonstrates where the LED strips are to be placed, as well as the general idea as to where to route their corresponding wires up to the engine bay. You can even mix and match with the installation, by wiring some LED strips individually to the module box and connecting the adapters for the remaining strips. 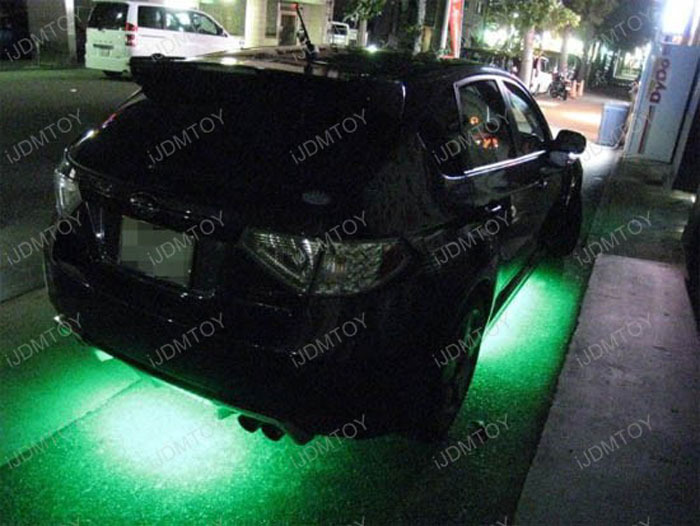 Step 1: Set the LED strip underneath your vehicle. Now is a good time to see if the underside of your car has any way of securely attaching the LED strips, including bolts, brackets or other small openings. Secure the LED strip with zip ties. We recommend zip-ties for every 12 inches of the LED strip, since double-sided tape may not be strong enough to securely attach the strip indefinitely. It helps if you have a friend to help you hold the LED strip in place during the attachment process, but if not you can just use the double-sided tape to temporarily mount the LED strip in place before you permanently secure it with zip ties. Step 2: Extend the wires. Route the 4 wires up to the engine bay and connect them to the module box. 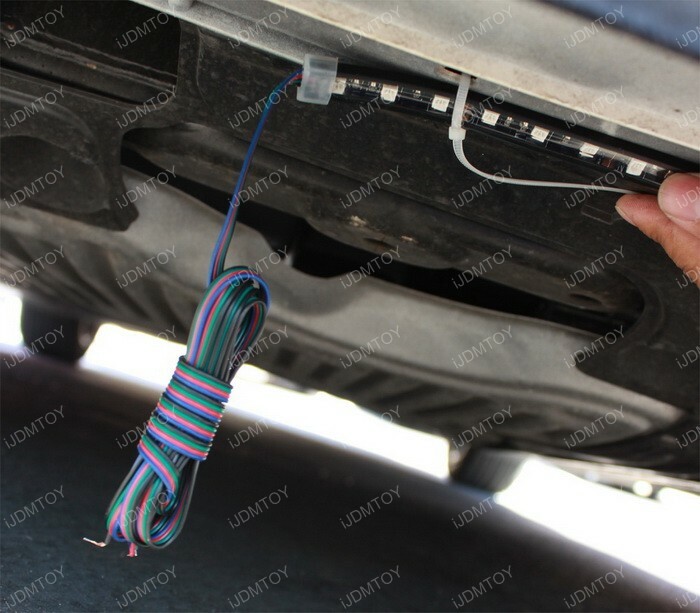 If the wiring of the LED strip on the rear bumper is not long enough to reach the front of the vehicle, you may use the extension wires that come with the package. Step 3: Tap the Red wire to battery positive/Black wire to negative or ground. If there is an optional wire, check the installation sheet to see what it's for. Step 4: Place the module box close to the battery, but away from the engine or radiator so there is no risk of heat damage. Make sure the location you place the module box at will be dry at all times. 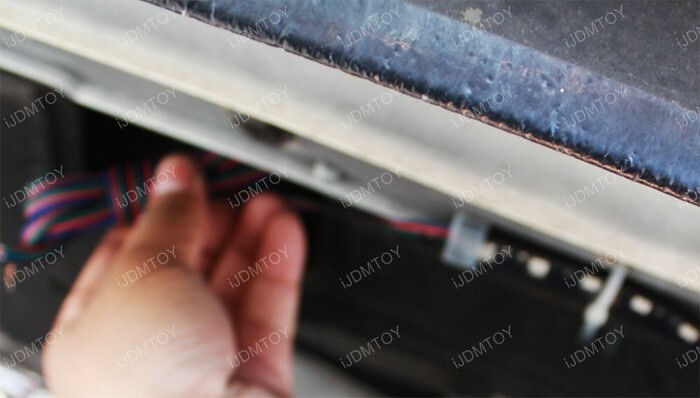 The battery/fuse box location is designed to stay perfectly dry so you don't have to worry about damaging the module box. Extend the antenna on the module box so you can get better reception even if the hood is closed. Test to make sure everything works and enjoy your set of underbody LED strips. This is a demonstration of a variant of this product, with the RGB LED strip lights.